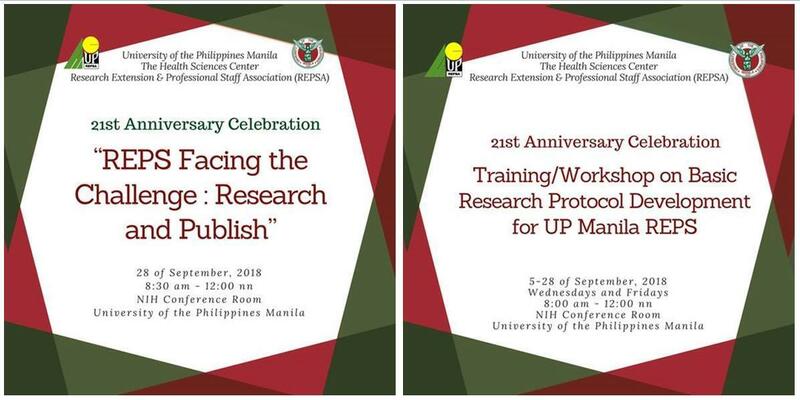 The Research, Extension and Professional Staff Association of UP Manila (REPSA-UPM) will be celebrating its 21st Anniversary with the theme, “REPS Facing the Challenge: Research and Publish”, on the 28th of September 2018. The activity is free of charge and attendance is on official time as approved by the Office of the Chancellor last 8 August 2018. For the REPS who would like to enroll in the workshop, please register on or before 30 August 2018. * Kindly email Ms. Lilibeth Manganip (upm-repsa@up.edu.ph), current President, for the link to the Google form. *Announcements have been uploaded beforehand on the REPSA-UPM FB page.